Colonel Madden: [to Dr. Stewart] 'Welcome to the jungle,' said the spider to the fly. Solo is an action movie about a Terminator-like android that is constructed and trained for the military. When a flaw is discovered, he is issued to be deprogrammed. Rather than face death, he chooses to flee into the jungles of Central America, where he takes refuge in a village. 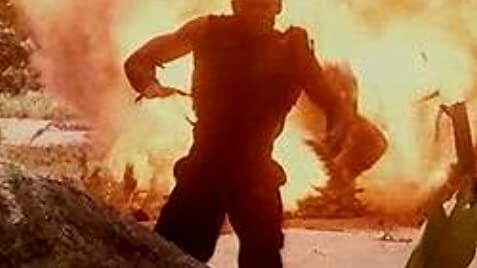 The military chases him into there, leading into a big action feast. 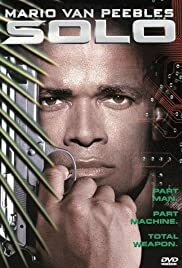 Mario Van Peebles does a decent performance the android. His movements and gestures look mechanical enough to get the job done. Actual scientific realism is abandoned in order to make a good action hero. And it works out; the action scenes aren't that spectacular, but they aren't all too bad either. The acting from the other characters is pretty bad, but I was not expecting anything too good. The special effects were decent as well. Solo is decent as an action flick, but very forgettable. It lacks the substance that most movies possess. But if you just want to pass a couple hours without much thinking, this will get the job done.